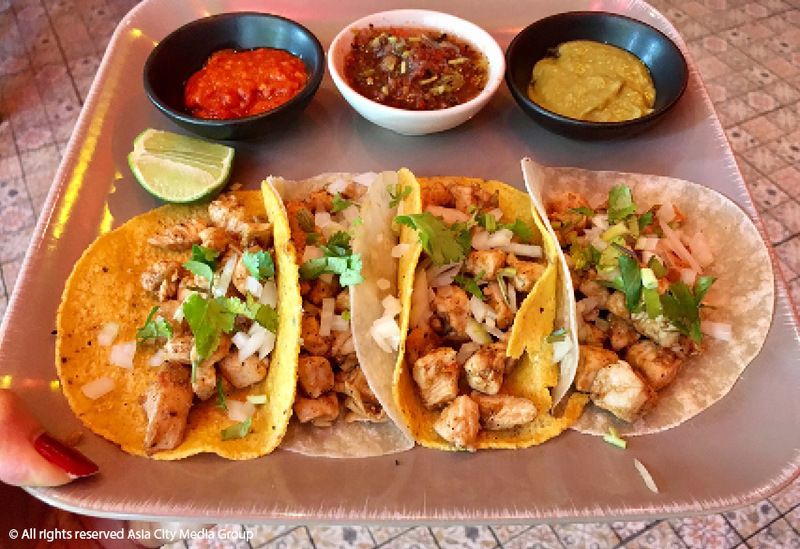 Note: Traditionally, all Mexican tacos are served with yellow or white corn tortillas. (Flour tortillas are used for quesadillas and burritos, if you must.) In Thailand, you’ll mostly come across yellow corn tortillas, which are coarser and more likely to crack when rolled. So best eat your tacos fresh! Hard, crunchy shells? Leave that to Taco Bell. The fact of the matter in Bangkok is that many restaurants outsource their corn and flour tortillas from the likes of El Charro, a Mexican-run food company around since 1992.
Who: The Commons’ Koh Chang blow-in, decked out with Day of the Dead skulls. The Tortillas: Mostly sourced through El Charro (see box: “Know Your Tortilla”), though they regularly use homemade versions in specials. Get this: The best-selling tacos de barbacoa (B200) has seven-hour slow-cooked lamb marinated in ancho chili paste with fresh coriander and onion, but we suggest the lip-smacking tacos placeros (B180), in which corn tortillas are filled with beans, salsa fresca, Mexican crumbled cheese and crispy pork rinds, served with a side of avocado mousse. Who: The former Suk 11 stalwart now at Asoke. The decor’s as vibrant as always, while the menu’s packed with Tex-Mex favorites and booze deals. The Tortillas: Perhaps the only place that uses Maseca corn flour and a traditional cast iron tortilla press. Get This: Chicken taquitos (B165/4 pieces), amazing rolled tacos filled with spicy, pulled chicken then deep-fried until crisp. Order a side of guacamole (B95) for dipping. The tacos de la baja (beer-battered fried fish, B130), are another good bet. Who: Formerly located way out on Srinakarin, this husband-and-wife team recently brought their home-style meals to On Nut’s Habito mall. The Tortillas: Made in-house from beginning to end, including the process of nixtamalization (a method of soaking corn in an alkaline solution to improve nutritional quality). Get This: The beef barbacoa (B290/4 pieces) is the big winner: corn or flour tortillas with a generous helping of slow-cooked beef, topped with onion, cilantro, lime and homemade salsa. Who: From a shipping container-turned-kitchen, two Mexican brothers serve up traditional Yucatan cuisine to a sprinkling of tables in the garden. The Tortillas: Sourced from El Charro. Get This: The panuchos de cochinita (B300/5 pieces) are a true taste of Mexico; corn tortillas filled with a Yucatan-style roasted pork marinated in achiote, sour orange and spices then cooked slowly within a banana leaf to seal everything in. The shredded pork is topped with briny red pickled onion, sliced, orange chilis and a small side of refried beans. Who: Sukhumvit’s enduring favorite for an after-work burrito and beer. The vivid decor gives every indication of the super-flavorful quesadillas and tacos on offer. The Tortillas: The corn tortillas are made in-house and have a pliable texture perfect for rolling up. El Charro’s flour tortillas are no let-down either. Get This: For something authentic, go for the carne asada taco Mexi-style (B135) with tender, flavorful New Zealand rib eye steak and chopped white onion and cilantro on a soft corn tortilla — just like you’d find on the street in Mexico. The carne asada taco Cali-style (B175) adds guacamole, salsa, sour cream and cheese. The Tortillas: Made in-house, the corn tortillas are deliciously pliable, but not recommended for delivery as they quickly turn to mush. Get This: Chorizo tacos (B200/3 pieces), flavor-packed Mexican chorizo (fresh pork sausage seasoned with ground chilies and spices) topped with melted cheese inside a small corn tortilla. Who: Bright and bold describes not only the decor, but also the food. Tacos & Salsa also just opened a second branch right by BTS On Nut, too. Get This: Forget the hit-and-miss service and tuck into an all-timer like the baja fish tacos (B270) with fried or grilled fish, cabbage, salsa and a creamy chipotle dressing. Who: Formerly Senor Pico, Rembrandt hotel’s long-running Mexican institution not only got a new name a couple years back, but also a more traditional direction. The Tortillas: Sourced through El Charro. Get This: The tacos al pastor (B295), which stars pork marinated in spices then served with fresh pineapple, chopped coriander and white onion. Beware: the bar features a wide selection of tequila. About the writer: Raised between California and Mexico, Megan Leon is a former chef who’s worked in the kitchens of Bo.lan and Eat Me. She now spends her time writing, seeking out in-any-way authentic Bangkok Mexican food, and perfecting her own tortilla recipe.